Only 1 left! This item ships in 1-2 days. 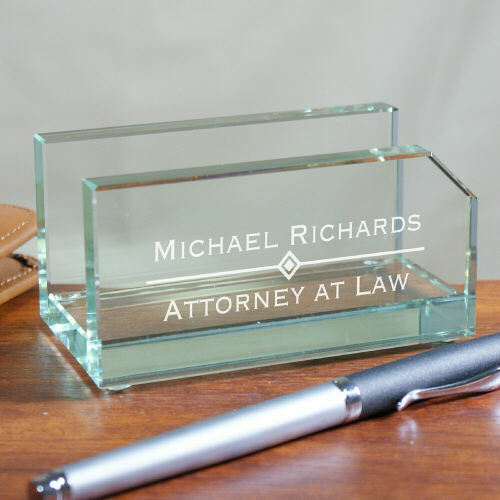 Add a distinctive desk accessory to your favorite Attorney, Doctor or Business Professionals desk with a Personalized Business Card Holder. This attractive glass business card holder is a sturdy and substantial glass holder perfect for displaying your professional business card with class and dignity. An Engraved Business Card Holder is a necessity for any business professional. Your Engraved Professional Business Card Holder measures 2" x 4" x 2 1/4". Includes FREE Personalization. Personalize your Business Card Holder with any two line custom message. Business Card Holder measures 2" x 4" x 2 1/4"
Very happy with the quality of the product and the price was very reasonable. The website is very easy to use. I like how you can preview your actual personalization before ordering. Perfect gift for our Physician - beautiful design and personalization. Additional Details GiftsForYouNow.com is the leader in Personalized Occupational Gifts. Whether you are looking for a Personalized Gift for your Doctor, Attorney, Business Partner or Boss, GiftsForYouNow.com has what you are looking for at very affordable prices.